​Those headed to the Oregon Coast expect to find waves crashing ashore, high bluffs, and, perhaps, a few gray whales rollicking around. They’re right. To find these and more while you’re in the Coos Bay area, be sure to take the Cape Arago Beach Loop near Charleston. With its variety of attractions, you’ll have a great way to spend an entire day or afternoon. 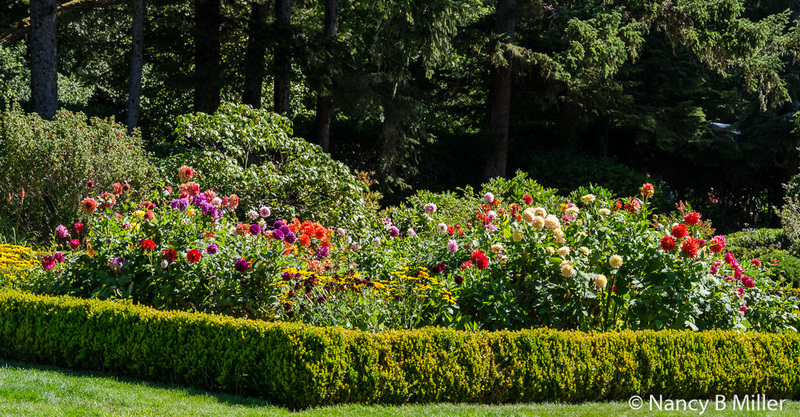 You can visit Shore Acres State Park where you’ll be amazed by the quality and quantity of its gardens. At Shell Island Interpretative Stop, sea lions and seals cram atop and near the huge boulders ascending from the water. The Cape Arago lighthouse, off in the distance, is worth photographing. You can camp or go beachcombing at Sunset Bay State Park or go hiking to see wildlife at Cape Arago State Park. Shore Acres State Park started as Louis J. Simpson’s private estate. A lumberman and ship building magnate, Simpson brought railroad service to the Coos Bay area in 1916. He also worked tirelessly for a military highway along the Oregon coast (Eventually U.S. Highway 101) during World War I and created the city of North Bend. He campaigned unsuccessfully for the Republican nomination for governor in 1918. In 1906-1907, Simpson built a large seaside home for his wife, Cassandra. She called it Shore Acres. It was a three-story mansion complete with an indoor swimming pool, large ballroom, five acres of formal gardens which still exist, a modern farm, and a dairy herd. The Simpsons moved to Shore Acres in 1915. Fire destroyed the mansion in July 1921, shortly following Cassandra’s death in April. Simpson remarried in 1922. He and Lela Gardner adopted two infant girls. 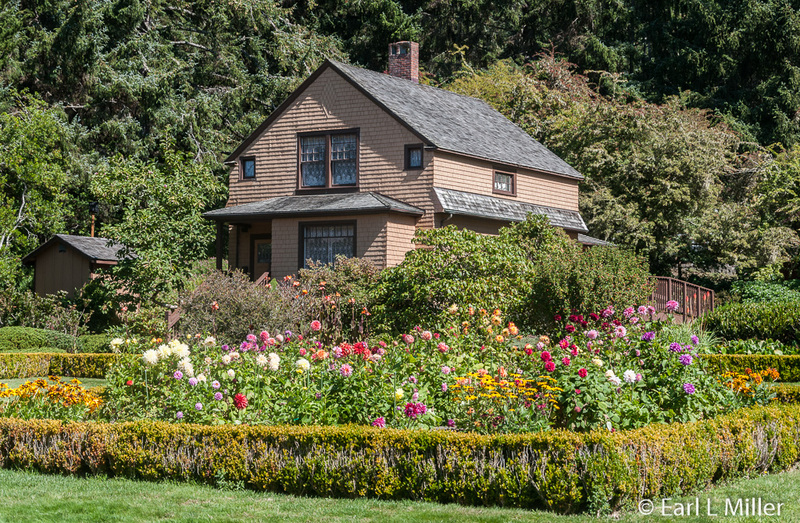 The family lived in the gardener’s cottage until 1928 when they moved into a new house on the original home’s site. The two story replacement was larger as it was 224 feet long. Simpson remained active in the timber business, rebuilding the old Southern Oregon Company’s sawmill at Empire. Unfortunately the crash of 1929 and the ensuing depression first took the sawmill and then property after property, including the mortgaged Shore Acres. By 1940, Simpson was bankrupt and the buildings and grounds fell into disrepair. During 1942, the Share Acres mortgage holder sold the estate to the state of Oregon for parkland. The property was leased temporarily to the War Department. Deemed unsuitable for habitation, due to structural deterioration, the house was razed in 1948. Today an observation building stands in its place on the bluff. It houses interpretative panels about the Simpson estate. Visitors find the plan of David Masterson, who designed the original garden, almost entirely intact. The central pond is spanned by an arched bridge and gravel paths. Rocks, you’ll see, were hauled up from Simpson Beach by horses in the 1920's. Monterrey Pines and Cypress trees surrounding the garden are original plantings. Many shrubs and trees from around the world were brought over via Simpson’s sailing ships. The Simpsons frequently opened the gardens to visitors. They also gave away seeds and cuttings. 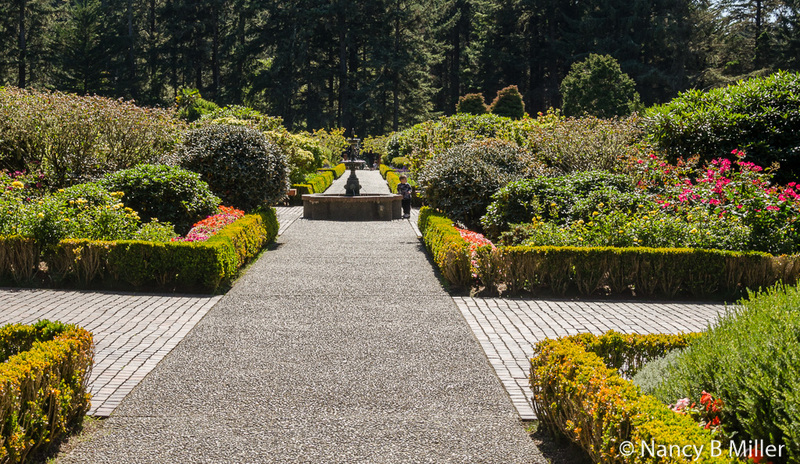 In 1960, the state parks landscape architect restored the gardens. 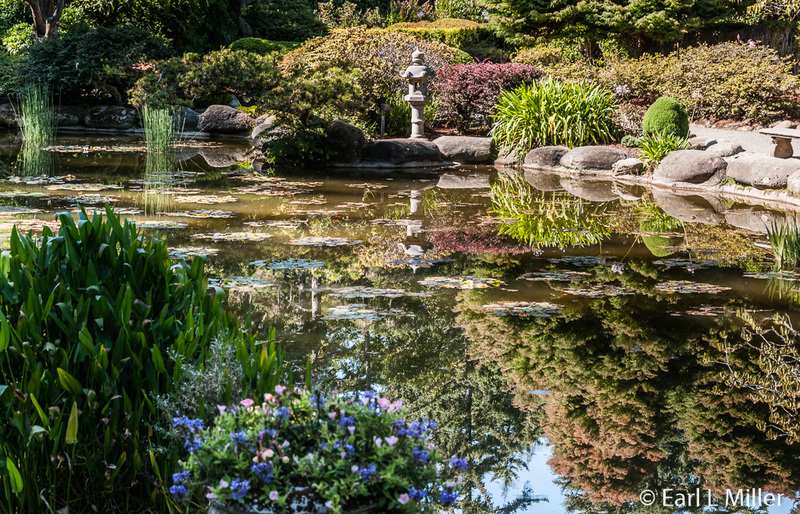 He planted ornamentals, plants, flowers, and more trees. What is exciting about the garden is not only how expansive it is, but how something is usually in bloom just about any time you visit. 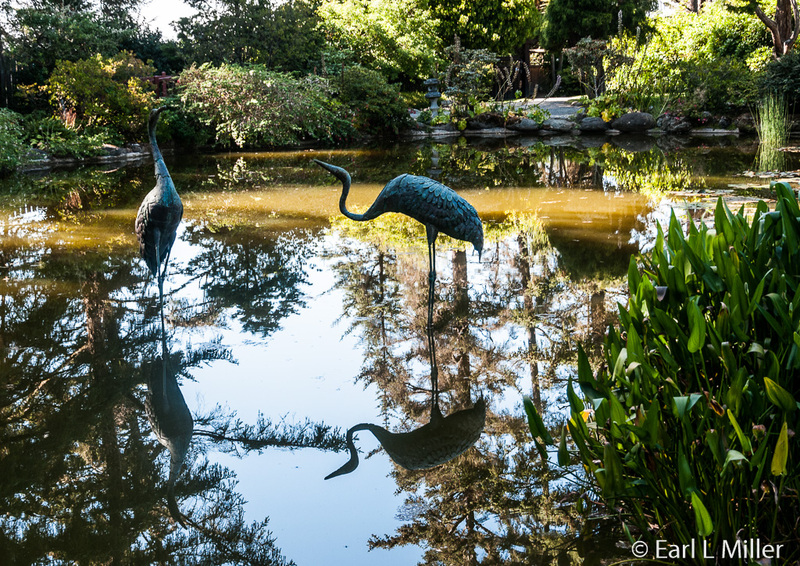 The gardens include the formal English style garden, rose gardens with a rose-testing plot, an Oriental garden complete with a lily pond, a greenhouse, a performance pavilion, and the original gardener’s house. 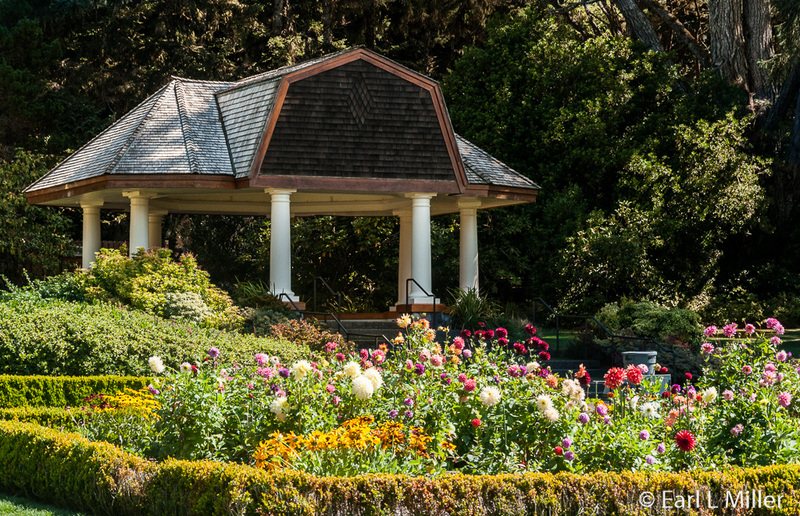 You’ll observe deciduous and evergreen perennials and Oregon’s largest Monterey Pine. It’s a Heritage Tree and is located in the east garden between the pavilion and the greenhouse. 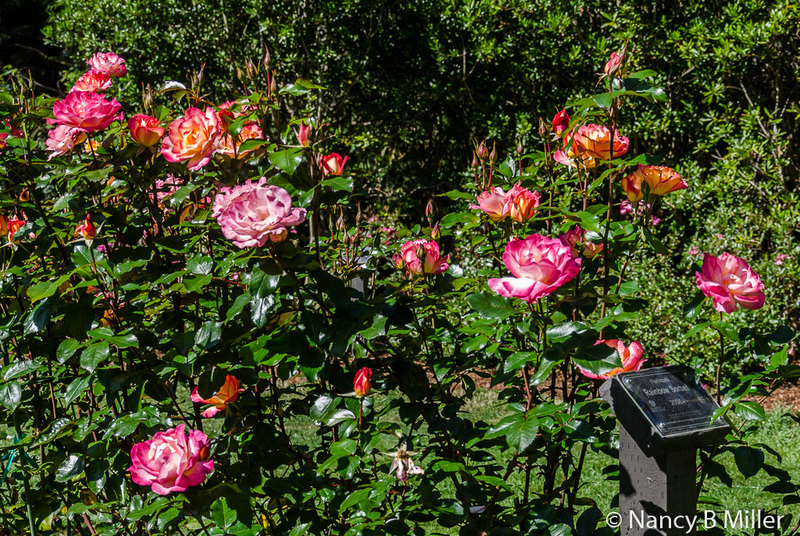 In 1977, Shore Acres received the designation of an All-America Rose Selections display garden. It held that title for 35 years, until the program ended in 2013. 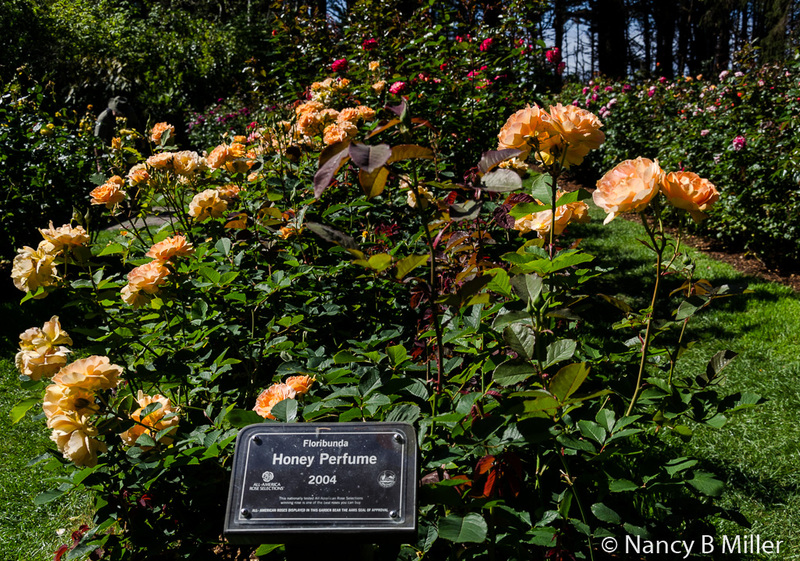 While admiring the roses in the AARS Rose Display Garden, look for the signs indicating the name, year of the award, and rose classification. The park has more than 800 rose bushes, Most fall into five classifications: Hybrid Tea, Floribunda, Grandiflora, Climber, and Miniature. The Hybrid Teas are known as the classic roses of modern gardens. 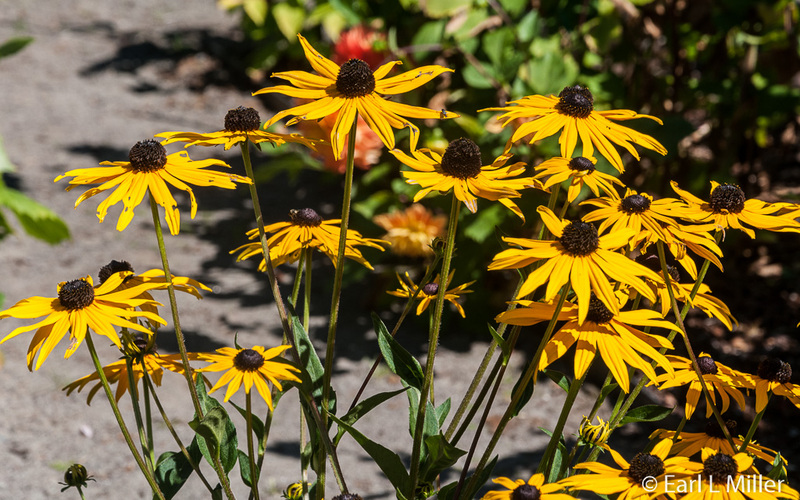 They are tall plants with large flowers on long stems. 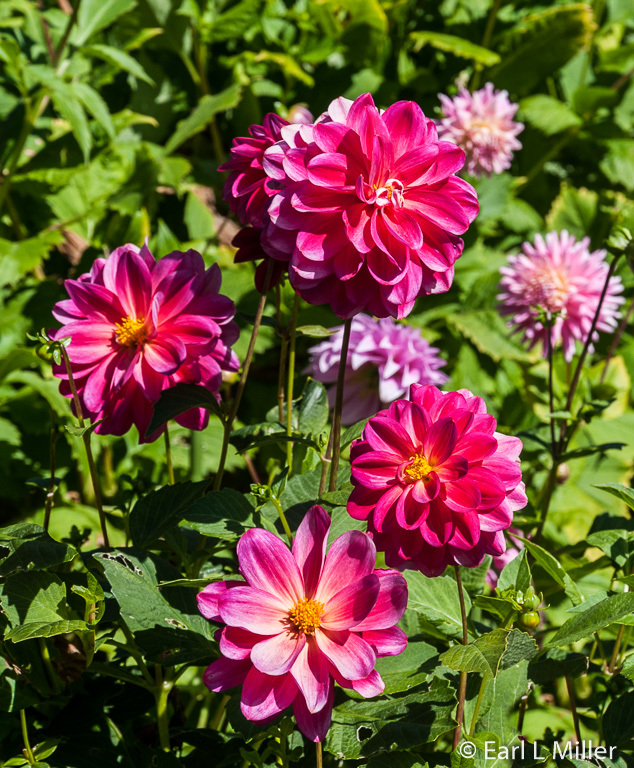 Floribundas are smaller, more compact plants. They bear smaller flowers in multi stemmed clusters. 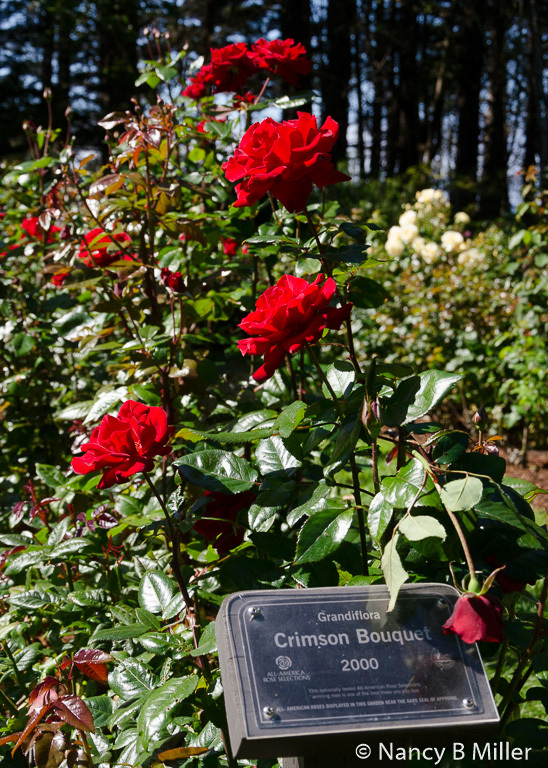 The Grandiflora combines the quality of Hybrid Tea’s larger blooms with the Floribunda’s quantity. The Climber has very long, flexible vine-like stems that hook onto other plants or are tied to supports. You’ll often see them grown on trellises, pergolas, and walls. Miniatures are the scaled-down versions of full-sized roses. From Thanksgiving through New Year’s Eve, staff decorates the gardens with 300,000 or more holiday lights. Even the sculptures are decorated. They’re lit from 4:30 p.m. to 9:30 p.m. This tradition has taken place every year since 1987. If you head out to the bluffs, it’s stated in their literature that you’ll see waves splash against sandstone bluffs sending water 120 feet into the air. It’s touted as the best storm watching location on the Coast. It’s also noted for whale watching, particularly during their migrations. A fully enclosed observation building allows you to view the ocean while protecting you from the weather. It has interpretative panels describing the Simpson estate’s history. Another option is to stroll down a trail to the secluded ocean cove at Simpson Beach. On this beach, elephant seals have been known to haul out to molt. I’ve read you’ll find views of hundreds of seals, sea lions, and other wildlife. The park requires a State of Oregon State Parks pass. These are offered at the information center and gift shop. You can buy a day pass for five dollars, a year pass, or a two-year pass. Your camping receipt from any of the state parks or campgrounds is accepted as a daily permit pass for those days registered. The receipt must be exhibited on the driver side of the dashboard. Shore Acres State Park is found on the Cape Arago Highway, 13 miles southwest of Coos Bay/North Bend and U.S. Highway 101. The phone is (541) 888-3732 for the park office. Hours are 8:00 a.m. to dusk daily. Near Shore Acres, visitors find Oregon Islands National Wildlife Refuge. Shell Island, Simpson Reef, and all rocks and islands along the Oregon Coast are part of it. Because of the abundance of wildlife on Shell Island, no public access is allowed. 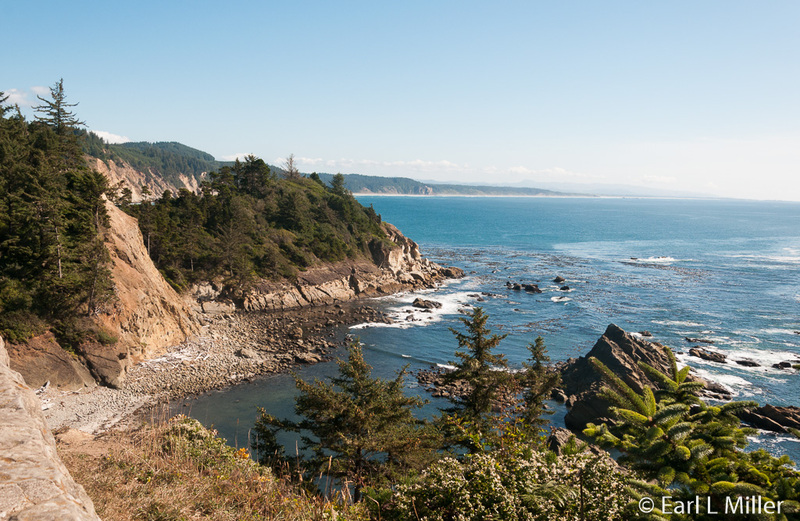 Viewing points can be found at Shell Island Interpretative Stop, where we parked, and at overlooks along Cape Arago. What was great were the interpretative signs in the parking lot at the overlook. They provided information on the mammals and seabirds. We were amazed at the large quantity of seals and sea lions we saw. The offshore rocks, islands, and reefs were peppered with them. If you have binoculars, bring them. For photography, a strong telephoto lens is required. We did not have a powerful lens that day so unfortunately we don’t have any photos of them. Earl said since they were a distance away that they would have looked like black dots. But with the naked eye, you’ll easily spot and enjoy them. We had already learned that most whales we were seeing off of Oregon’s shore were gray whales. In fact, at the interpretative stop, we saw one spouting. Adults are about 45-feet in length and weigh 45 tons. Because of migration from California, they swim close to Cape Arago in March to June on their way to Alaskan waters. Some of the younger whales prefer to stay off the Oregon coast for the summer and can be seen feeding beyond Simpson Reef. December to February is another good time as the whales migrate south to Baja breeding lagoons. Gray whales have very blotchy skins because barnacles, about two inches in diameter, grow on the whale’s skin in patches. This provides for a mottled appearance. The animals making the barking noise that you’ll hear at Simpson Point are California sea lions. What you are seeing are the males since the females and their pups remain in California. The males leave after breeding season and migrate north, arriving in Cape Arago in early August. Some advance as far north as British Colombia. In late summer and fall, you can see 1,500 to 2,000 males at Cape Arago. A smaller number is present during the winter with the amount increasing as they migrate south in the spring. Male California sea lions are brown with a sun-bleached bump on their head. They are often seen on Shell Island and the same rocks as the Steller sea lion. When their number peaks, they are located on any rock they can find. Steller sea lions are also named Northern sea lions. They are the largest of the sea lions. The best place to spot them is on the northern rocks of Simpson Reef, on the large pointed rock to the north of Shell Island and on the Shell Island beach. They use Cape Arago as a haul-out site during the non breeding season. They are light, sandy brown in color with the males three to four times larger than the females. Haul-out means the behavior associated with pinnipeds such as seals and sea lions where they temporarily leave the water between periods of foraging activity for sites on land or ice. This allows for such activities as mating and breeding, avoidance of predators, social activity, and rest. Northern Elephant seals are the largest seals and deepest diving mammals at Cape Arago. Their number peaks in the spring, but they can see seen all year. Sometimes they lie on the beach in front of Shell Island, often up against the island’s base. They haul-out at Camp Arago to rest and molt, not only their fur but the upper layers of their skin. During this three-week period of molting, they do not eat or drink. They have been known to dive to depths of 4,000 feet. They feed on sharks, rays, and deep water squid. Harbor seals reside in the area year round on the outer reef and on Shell Island. They are light to dark gray with contrasting spots. Pups can swim at birth, nurse for about three weeks, then are weaned and are no longer cared for by their mother. You should see the Black Oystercatcher in this area as they are year round residents. These black birds are known for their brilliant red, long bills. They use these bills to open mussels found in the intertidal area. Be sure to listen for their shrill call. Ospreys are the only raptors that eat almost exclusively live fish, When they return to the Oregon coast each year to breed, they often use the same nest. After their chicks fledge in October, Ospreys migrate to Mexico for the non breeding season. Spot Pelagic Cormorants by their white patches on their thighs during the breeding season. They nest on Shell Island’s ledges, laying two or three eggs in July. Their nests are made from seaweed held together by guano. Chicks feed by putting their heads into the adult’s throat to retrieve the fish. Cape Arago Lighthouse is one of the few on the Oregon Coast where you can’t get a close-up view. It’s south of the entrance to Coos Bay on an island surrounded by a fence. The island’s shape is portrayed as a bony fist with an index finger pointing northward. It steep sides are now eroding into the sea. Views and photos can be obtained from a viewing point on Cape Arago Highway or from Lighthouse Beach. A good telephoto lens and binoculars are mandatory to enjoy it. It’s the third lighthouse on the island and was once the state’s oldest continuously operating light station. It is presently decommissioned. Congress authorized funds in 1864 to build the first lighthouse. It was lit on November 1, 1866 and was Oregon’s second lighthouse in operation. It had a 25-foot octagonal iron tower supported by stilts. Inside the stilts was a staircase, exposed to wind and rain, which circled up to a small watch room and above that the lantern room. Its fourth-order Fresnel lens beamed light for 14 miles. It was a white light with a flash every two minutes. This lighthouse was connected to the keepers’ residence via a 1,300-foot wooden walkway. A long term problem for the keepers was how to get from the mainland to the island. Rowboats were initially used. A low footbridge was built across the channel in 1876. A strong gale in 1877, washed it away as well as the station’s boathouse, and a portion of the tramway used for bringing supplies from the beach to the lighthouse. Rowboats were used again until a new bridge was built. Using them proved to be perilous leading to one keeper’s drowning. Another keeper was caught in a storm and blown 90 miles northward, subsisting for three days on a can of oysters, a beet, and a bag of onions. He finally landed his craft near Florence. The lifesaving station, established in 1878, moved to the mainland in 1891 to be more accessible. After the low bridge was repeatedly washed away, in 1889, the Lighthouse Service wanted to build a high bridge. Since the bids to construct it were exorbitant, a 400-foot tramway with a cable car was built instead in 1891.Two frame towers were built, one on the island and one on the mainland.The car, suspended 60 feet above the water, was pulled across the channel by a hand-operated winch located on the island. The tramway was completed in 1891 and worked well for about seven years.The Lighthouse Service again decided to build a high bridge and sent ordered material across via the tramway. As the bridge neared completion one day, three people, including Keeper Wyman, were being winched across the channel.The cable broke with everyone falling into the water. Two suffered minor injuries. However, Wyman had his legs crushed resulting in a later amputation of one because of this accident.The bridge was finished eight weeks later. Since the light was exposed to the elements along the Pacific, because of its location on the island, it soon needed repairs. Much of the station’s infrastructure, over 35 years, had to be either repaired or replaced. Among the improvements made was the construction of a duplex for three keepers and the encasing of the tower in brick and stucco. A new fog signal, a Daboli trumpet, was installed in 1896 in a brick building next to the tower. After operating 10 years, erosion threatened the fog signal building and lighthouse. Ships’ captains also demanded more modern equipment. A lighthouse consisting of a wood-frame fog signal building with an attached octagonal tower was built near the duplex. It was 100 feet above the water providing better illumination, making the light visible for 16 miles. It revolved every 20 seconds producing three white flashes, separated by four seconds, followed by 12 seconds of darkness. The light went into operation on July 1, 1909. Construction for the third, and current, lighthouse, made of concrete, began in the early 1930s. Illuminated in 1934 with the second light’s fourth-order lens, it stands at 44 feet above sea level. In 1936, the first tower was razed. The second light’s tower was removed, and its building became the keepers’ office. The light was automated in 1966. A modern lens replaced the Fresnel lens in 1993. That year it was listed on the National Register of Historic Places. It served for twelve more years before becoming decommissioned on January 1, 2006. In 2016, the third lighthouse remains the only building on the island. The keepers’ duplex was razed in 1957 and the second lighthouse in the 1960's. Cape Arago was once home to Indians, who called the island “Chief’s Island.” On August 3, 2013, the Coast Guard transferred ownership of the Cape Arago Lighthouse and grounds to the Confederated Tribes of Coos, Lower Umpqua, and Siuslaw Indians at a ceremony held on the lighthouse grounds. Before doing that, the Coast Guard made extensive repairs to the lighthouse and removed the high bridge to eliminate unauthorized access to the island. Located about a mile north of Shore Acres, Sunset Bay Park features sandy beaches protected by towering sea cliffs. It has tidepools, picnic facilities, restrooms, and campgrounds. Beachgoers can beachcomb, bird watch, swim, or go boating. This state park provides hiking trails, picnic tables, restrooms, and excellent opportunities for viewing marine life. Take the steep south trail to the tidepools to see a variety of sea life. The north trail lets visitors view offshore colonies of seals and sea lions. It’s closed from March to June to protect the Harbor seal pups during birthing season. For those who enjoy water sports, the park provides opportunities to fish and scuba dive. It’s located a mile south from Shore Acres. Take Cape Arago Highway. Cross the bridge into Charleston. When the road forks, veer to the left to follow the Cape Arago Beach Loop. This road will eventually loop back around.